Come along with your best friend for 4 days of training, rejuvenation and transformation in beautiful Byron Bay! Run by SitDropStay Head Trainer George Lygidakis, this unique workshop/retreat has been specifically designed to help you to understand, connect, communicate and be able to influence your dog at a deeper level, creating a more enjoyable and fulfilling experience for both of you. Within each of us is the ability to communicate, connect and interact with our dogs in a more natural and effective way. This communication comes from our inner being, or a place of stillness. A place beyond thought and mind and the need for concepts or theories. It is an intuitive inner knowing and expression that comes from within. A dog whisperer communicates with dogs from this place. Discover what is inhibiting you from expressing what you want to create with power and direct communication. Identify and heal any emotions or beliefs that are getting in the way of your communication clearly and authentically. By getting in touch with this part of ourselves around our dogs we can not only connect with our true selves, but also heal any inhibitions or emotional blocks we have developed which stops us expressing our true power and ability to direct chi energy or prana. Our dogs understand this form of energetic communication because it is how they communicate with each other. This workshop is for everyone who wants to enjoy and improve their relationship with their dog, and is looking for more than just the concept of ‘training’ their dog. Whether you have lost your confidence, feel frustrated, dis-empowered or disillusioned by current mainstream approaches and feel there must be a better way, or simply love the idea of having a wonderful holiday with your best friend, let us educate and empower you to get where you want to be. How to be someone your dog wants to follow off-leash and willingly co-operate with. How to keep your dog calm in all situations. To easily switch your dogs state of mind from active to passive. What your dog means to you and what role you take on around them. A more natural, effective and respectful way to coexist with your dog. How to share affection and reward with connection rather than treats or toys and why your dog craves this. How to use your intent and energy in a calm but powerful way to influence their behaviour. How to expand, retract and project your energy field when communicating with your dog. Hands on training and practical lifestyle techniques you can take home for the real world to use immediately. The price of our 4 day retreat is $1190. For those who are wanting a bit extra, Alchemy Wellness Centre (who are onsite) offer Acupunture, Chinese Herbal Medicine, Kinesiology and massage, which (as well as wonderfully relaxing and rejuvenating) can be extremely powerful in shifting blocks/negative beliefs/behaviours both in owners and dogs (rarely is it isolated). Please contact them personally if you would like to discuss booking a session with them. 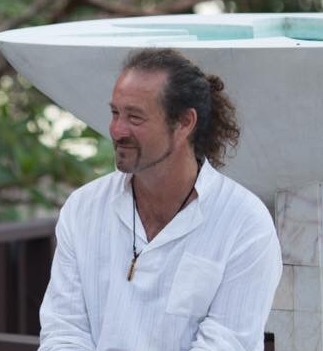 Our retreat facilitator is SitDropStay and Quantum Canine head trainer and founder George Lygidakis. George has been training dogs for over 30 years with enormous success. This is down to the unique dog whispering methods he has developed, that continue to have to incredible success with dogs of all ages and breeds. As a dog whisperer, George understands that it is the your energy or presence that allows your dog to stay calm, relaxed and co-operative. Communicating from this place removes the need for treats, force or medication.